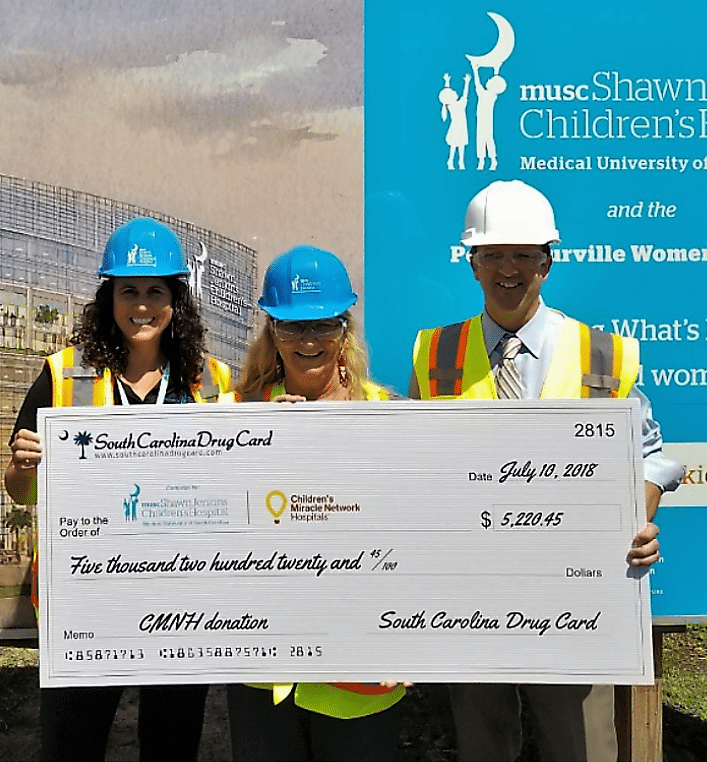 On July 10, 2018, Norrene Bacher, South Carolina Drug Card representative, presented a check to MUSC Shawn Jenkins Children’s Hospital. Mimi Dorman, Corporate Relations Manager (l), and John Sion, MUSC Health Senior Projects Manager (r), were pleased to receive the check donation in the amount of $5,220.45. This check presentation was a special one, as a new Hospital is under construction and will open next year. In an effort to continue to raise funds for the construction & increase awareness of the South Carolina Drug Card and CMN relationship, Mimi has asked Norrene to bring pharmacy staff to tour the new Hospital. Mimi and Norrene will continue to work together on other initiatives throughout the year to bring attention to the new Hospital and the partnership between South Carolina Drug Card and Children’s Miracle Network Hospitals. Since 2015, the United Networks of America partnership with Children’s Miracle Network Hospitals has raised over $2.4 million dollars for local children’s hospitals. Of this, $5,220.45has been raised for MUSC Shawn Jenkins Children’s Hospital.